The family was out of town with my mother-in-law on Monday, and I got a little bit of hobby time after getting all the necessary chores done. I got some sculpting done, which moved a number of Inq28 figures into the "ready to paint" category, which if you see the tray at the left of the picture is a bit large. Center are those that need more work, and lower right as another six or so figures that need to have various sculpting and filling done. Honestly, while I love building these figures, I have grown tired of having my work space dominated by their half completed bodies and the thousand little bits of guns, hands, arms, heads and so on you can see to the right. I think that after a few more figures are completed, the remainder, and all the bits will be tidied away for a while. Working at the kitchen table just to have enough space is not very sensible when I have a whole desk that should be used in that way, rather than as a large bits box. 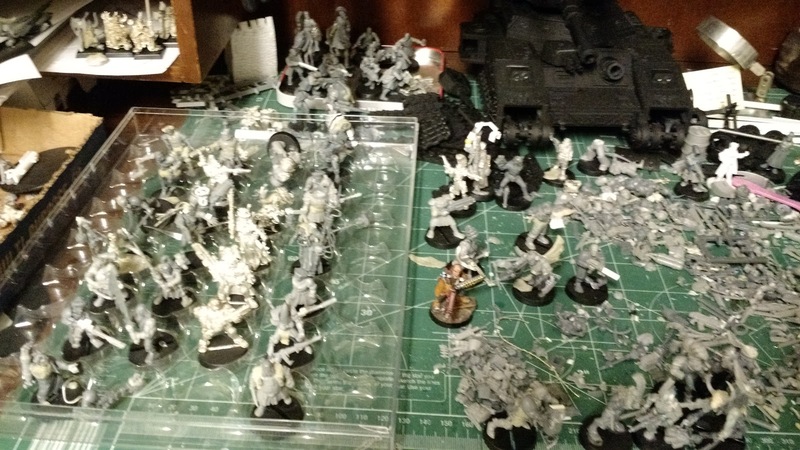 Also, with the renewed interest in Xwing, and the forthcoming release of Killteam (and discussion with my buddy Thedocta about getting him into 40k), the space may be needed soon for other projects. Also visible to the keen eye, Baneblade of shame, converted dwarf longbeard, Necromunda gang, Empire general and warrior priest. The puzzle have been solved! 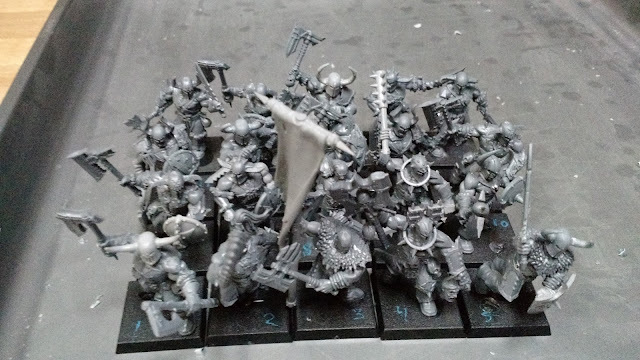 Just a quick post to show off how my various conversions paid off and allowed me to rank up my Bloodreavers in an effort to make them serve as Chaos Marauders. As you can see from the photo, I numbered the bases with a pen, because they really only fit the one way! 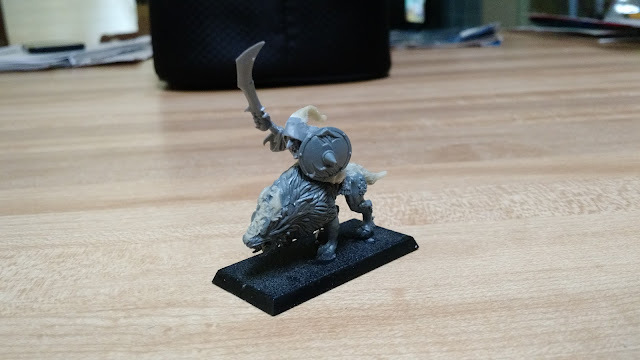 Most of my conversions are head and left arm swaps, with a few weapon or right arm changes too. Being plastic, the figures were relatively easy to modify, and I fortunately had a bunch of Chaos bits to draw on for the conversion. I will show more of these figures later, but I was just excited that I was able to get it done at all. 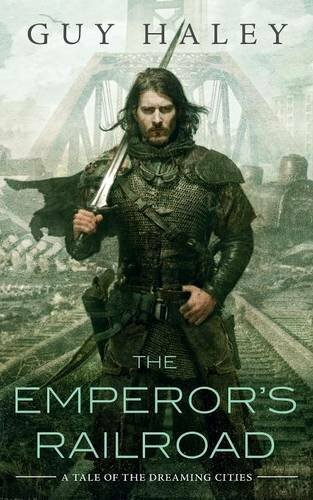 I have been on vacation the last week, so have not had much hobby time, but I did get a chance to read a few books, including the Emperor's Railroad by Guy Haley. Set roughly 1000 years past an apocalypse of some sort, this novella is a recounting of an experience a young boy has with the Knight Quinn as he helps the boy and his mother move from one town to another. A knight is something of a paladin sort, with access to tools and technologies forbidden to the general population by the Angels. (Aliens? AI? Actual fallen/descended Angels?). There are also technological artifacts and the undead, which makes for a dangerous trip. Anyway, the book was good, and I liked its very gritty look at a post apocalyptic world. Characters were well written, and I got a grasp of their motivations and histories fairly quickly. Unfortunately the "book" was very short at 176 pages of fairly large type, and more, it felt a bit short too. A longer version of this same story would have been very welcome. That said, I am looking forward to reading the next volume in the series, The Ghoul King, which just was released a month ago. Another part of this book that I enjoyed was thinking about how well it would fit for a sort of "gonzo" D&D campaign world. Want to do dungeon crawls where you might fight Zombies/Robots/Dragons/AI/cultists? Knights with swords and pistols? Well this setting could easily handle all of that, and plenty of detail is available from this book to give your future world a nice gloss. Just the sub title of "the dreaming cities" gets my brain working on ideas, and really that is the sign of a good setting. For my birthday this year, my sister and her family got me the new X-wing expansion Imperial Veterans. 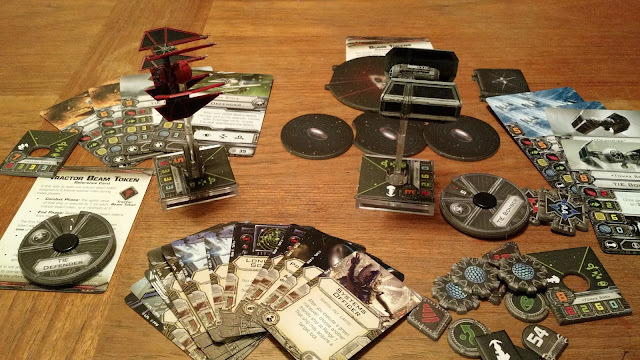 A larger expansion box for the X-wing miniatures game, this box gives you two repainted miniatures (one TIE Bomber, and one TIE Defender), as well as an array of different upgrade cards, and a new scenerio. 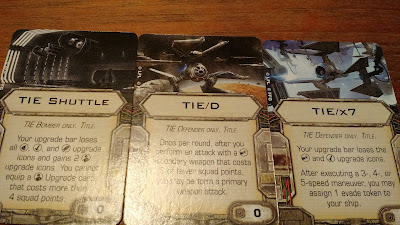 Probably the most interesting cards in this expansion are the new title cards, which substantially improve the TIE Defender, and add an interesting new option to the TIE Bomber. 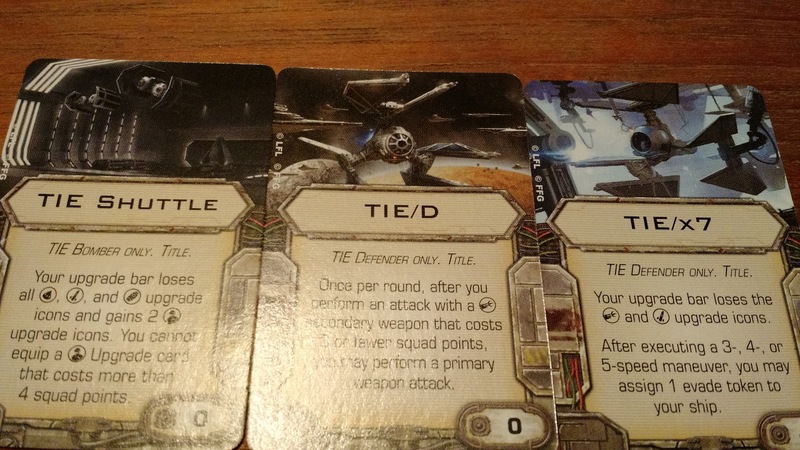 Of these, the TIE/D title is the most exciting, since it allows you to shoot a secondary and a primary at the same target, which when coupled with an ion cannon or the new tractor beam, allows you to damage and restrict the movement of a target in the same round. I had the chance to actually PLAY the game this weekend with my buddy, and now my head is awash with grand X-wing campaign ideas... we will see if any of that comes to fruition. In what is a pretty obvious direct (yet inferior) copy of Sebastian's work over at Eastern Empire, I converted this chaos hound to be slightly more wolfy and mounted a night goblin on his back. 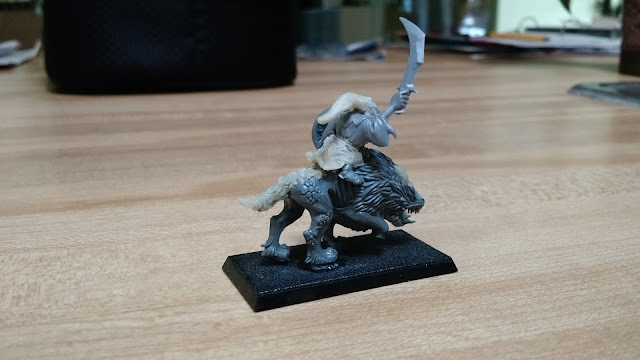 This required cutting off the original legs at the waist, using gnobler legs on either side of the wolf, a bit of sculpting, and then result.